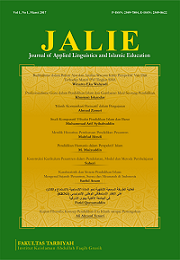 Journal of Applied Linguistics and Islamic Education (JALIE), with registered number ISSN: 2549-7804 (Print) and ISSN: 2549-8622 (Online), is a peer-reviewed journal published twice a year (March and September) by The Faculty of Eduction (TARBIYAH), Institut Keislaman Abdullah Faqih (INKAFA) Gresik. JALIE is intended to be the journal for publishing articles reporting the results of research on Education. JALIE invites manuscripts in the topics applied linguistics and islamic education, specifically for model of learning, the method of learning, curriculum, education strategic, the management of Islamic education, and some issue of learning others.